Search our archive for Bibles, autograph albums, IDed photos, documents, correspondence, and other treasures from the past that may relate to your family or area. This project is ongoing, so please visit often. Many items are available for purchase. Cabinet photographs of Isaish Rich and wife Eunice Hacker (Rich) Cartland of Portland, Maine. The photographs were taken by the Lamson studio and Charles W. Hearn studio, both of Portland, Maine. 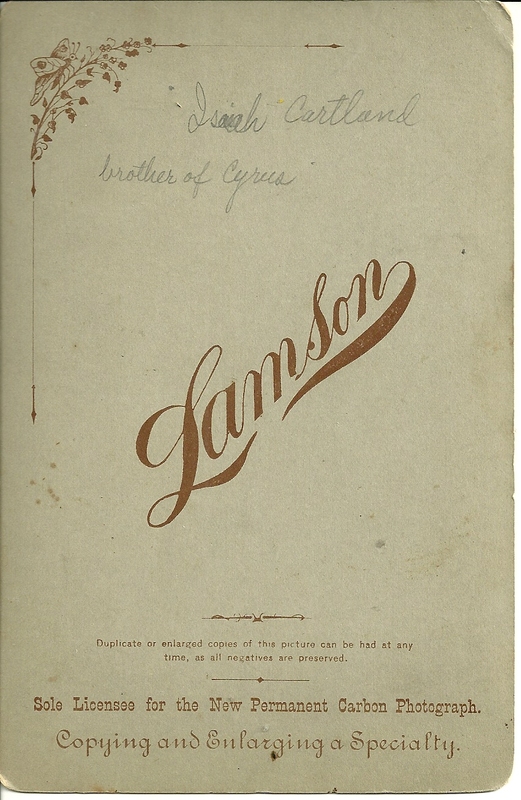 The reverse of the photograph of Isaish notes that he was the brother of Cyrus. Mary Rich (Cartland) Graham, Isaiah's daughter who married William Graham. The identification gives birth and death dates for Mary. 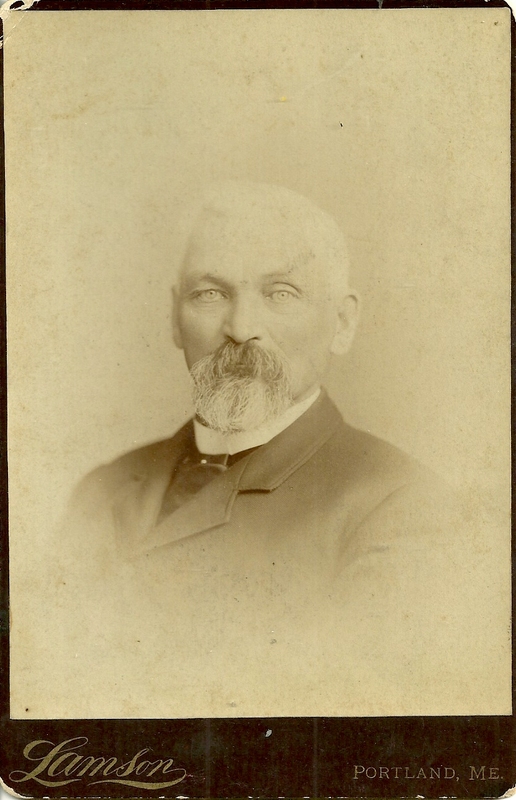 William T, Graham, son of Mary Rich (Cartland) Graham and husband William Graham. This photo has their son, who was born 30 December 1879 and died 21 September 1927. He married Lucy Ellen Cartland, his second cousin, I believe. The identification gives birth and death dates for William T. Graham. Isaiah Cartland was born September 9,1829 at Windham, Maine, the son of Charles and Miriam (Robinson) Cartland, both of whom were born in New Hampshire and moved at some point to Windham, Maine. Isaiah's paternal grandparents were Pelatiah and Anna (Hanson) Cartland, who were both born in New Hampshire and later moved to Maine. It was interesting coming across Anna Hanson of Dover, New Hampshire, as I have Hanson relatives from there. Isaiah's maternal grandparents were, I believe, Stephen and Content (Alley) Robinson, both from towns near the Maine/New Hampshire border. 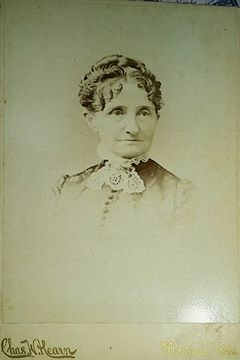 In 1852 Isaiah married Eunice Hacker Rich, who was born December 27, 1827 in Lynn, Massachusetts, the daughter of Thomas and Eunice (Jones) Rich. I don't have any information on the parentage of Thomas Rich, but Eunice Jones was the daughter of Amos and Eunice Jones. Isaiah and Eunice lived in Portland, Maine and raised a daughter, Mary Rich Cartland and a son Thomas P. R. Cartland. If you have corrections and/or additions to the information above, please leave a comment or contact me directly. Yes, I still have it. Please contact me via my email address, which is listed under Inquiries near top right. Heirlooms Reunited by Heirlooms Reunited is licensed under a Creative Commons Attribution-NonCommercial-NoDerivs 3.0 Unported License. Based on a work at heirloomsreunited.blogspot.com. Permissions beyond the scope of this license may be available at heirloomsreunited.blogspot.com.